One of the Great Surprises of my life came on a hot, clear summer day last August. My sister in law was visiting, and she and I decided to take the kids over to National Harbor in Maryland. “You know, Mommy, I heard they built a Ferris wheel there. I think we should ride it,” offers my eldest. SAY WHAT? Now, I’ve read the parenting books, and I know we’re not supposed to label our children. So, in lieu of describing my seven year old as cautious, I’ll just say that he prefers to apply the road sign, PROCEED WITH CAUTION, to as much of his life as possible. If JP determines something to be of physical risk, he’ll likely avoid it all together—or spend weeks (ahem, years) ruminating on it, observing others doing it, until he’s absolutely sure he can proceed safely and confidently and without anyone’s assistance (see: bike riding). Heck, there are slides in our neighborhood that he still deems too tall to slide down. So, I’m suddenly supposed to believe that my son is going to leave the safety of the ground aboard a giant rotating wheel that he has never actually laid eyes on? Don’t get me wrong, I was positively giddy at the prospect (wait, do you think we can start going to theme parks and rock walls?! ), although I was careful to do my best nonchalant impersonation when I answered him, “Yeah, sure, we can do that, maybe, whatevs.” No need to jinx things with my shock and excitement. As we got in line and paid a mere fortune (honestly, I would have forked over any amount to reward this burst of spontaneity), I watched with trepidation as the color began to drain from JP’s face. I realized he was listening to the attendant, who was loading people into what turned out to be giant glass-enclosed cars and then pointing out the large red “panic” buttons located in each interior. “Why do they need those buttons?” JP asked me. “Um, in case someone feels sick and they want to come down and get out. I’m sure they hardly ever get used,” I quickly responded. Although I was beginning to wonder the same thing. And then we were bolted in, quickly rising higher and higher, until we were suspended over the water on one side and the itty bitty figures of people waiting in line on the other. And then—as is the custom with every Ferris wheel I’ve ever been on—we were paused, dangling, SWAYING, for what seemed like an eternity, as a new round of people boarded at the bottom. And we still had four more laps to go. But we did it. All of us. All five laps. We oooed and we ahhhed, and then we ventured that we might, we might, do it again someday. As we stepped off, I turned and asked the attendant (out of earshot of JP), “How often do people use that panic button?” She rolled her eyes. “You have no idea,” she said. But I did. Weeks later, I asked JP what made him decide to ride the Ferris wheel. He started rambling about metal and motors and making grand gestures with his hands—and, suddenly, it dawned on me that it was sheer engineering that had seduced him. Even before he saw it in real life—when it was just something he had seen in pictures—the lure was magnificently romantic. As if right on cue, Kathryn Gibbs Davis’ Mr. Ferris and His Wheel (Ages 5-10), a fascinating picture book biography of the man who invented the Ferris wheel, was soon published and quickly became a favorite in our house (along with the other engineering-themed picture books listed at the end of this post). Once again, as with the best non-fiction children’s books, I was learning alongside my children. Of course, it wouldn’t be a story if there weren’t plenty of speed bumps along the way. After initially flat-out rejecting George’s proposal as “so flimsy it would collapse,” the Fair committee later reluctantly awarded him the bid, on the contingency that George secure his own funding (which he did by depleting his personal savings, so fervently did he believe in his dream). Next, there was the stress of time: Ferris had only FOUR MONTHS to source materials, hire a crew, construct a perfect, enormous circle (“834 feet in circumference, rising 265 feet above the ground”), and then make it spin with the “precision of a small watch.” Oh, and did I mention that the passenger cars were the size of living rooms, with enormous picture windows and velvet seats to boot? The next time your child tells you something is impossible, have them think on that. Still, if those challenges aren’t enough to rivet your child’s attention, let me tell you about my son’s favorite page (can we say dynamite?). When George and his crew first began work on the foundation, in the middle of one of Chicago’s coldest winters, they not only had to blast through layers of ice, but they had to battle 35 feet of quicksand (yes, that’s right, the Fair’s site turned out to be atop QUICKSAND). All these happenings are narrated seamlessly and compellingly by Kathryn Gibbs Davis, appealing to a wide range of ages. Some of the more technical information is presented in optional asides (not optional for us, of course), but even the engineering specifics feel accessible. Still, not being an engineer myself, I have to say that, for me, the greatest appeal of this book lies in Gilbert Ford’s exquisite mixed-media watercolors, which twinkle and soar and PERFECTLY ROMANTICIZE the dream, the ambition, the teamwork, the national pride, the engineering prowess, the magic, and the fun surrounding the Chicago World Fair. The fantastical color palette of turquoise, hot pink, deep purple, and midnight blue makes the experience of reading the story even more magical. I get goosebumps just thinking about how the Ferris wheel must have looked to the people who stood before it, especially when it was lit up at night. At that time, houses were still predominantly lit with candles, so this was most people’s first chance to see electricity in action. Farmers and executives alike came to see the 3,000 electric light bulbs in action. Why, it must have seemed like the work of fairies. At least, that’s how it is painted. Of course, Davis’ story reminds us that the wheel was, in reality, four months of incredibly hard, back-breaking labor, nearly all of it performed by human hands. Not to mention exacting conceptualizing, measuring, and overseeing by human brains, most notably those of George and his engineering partner, William Gronau. 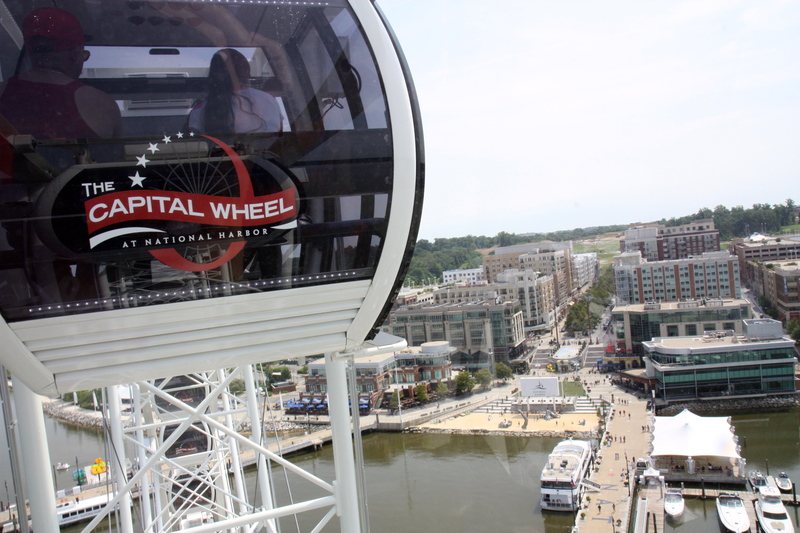 During the nineteen weeks the wheel was in operation, 1.5 million passengers rode it. It revolved more than 10,000 times, withstood gale-force winds and storms, and did not need one repair. Perhaps, no matter how cautious we might consider ourselves (or our children), we are powerless to resist the seduction of the Ferris wheel. Untethered from the ground, given over to pure engineering beauty, we feel the awe-inspiring magnitude of the human spirit. But it does feel good to be back on firm ground when it’s done. 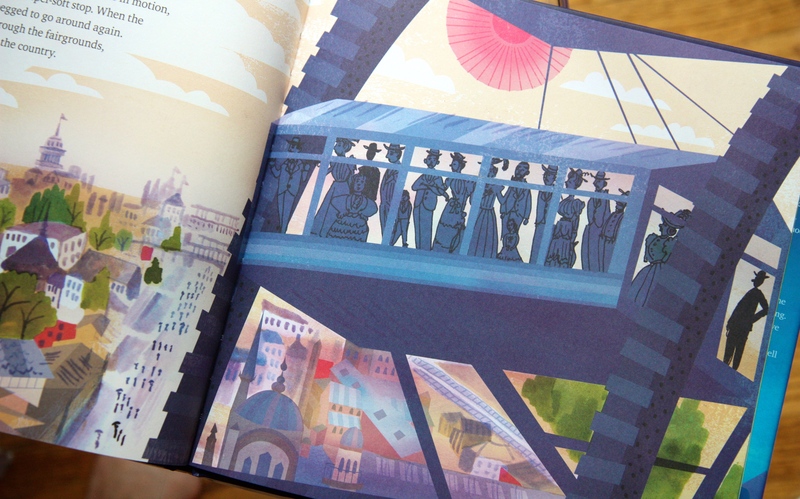 AND get this: there is ANOTHER picture book bio about George Ferris coming out this fall, titled The Fantastic Ferris Wheel: The Story of Inventor George Ferris, by Betsy Harvey Craft. As far as I can tell, it details the same story but with more text and information, so it could potentially be great for an older child. It also looks beautifully illustrated (by Steven Salemo)—in a completely different way than Gilbert Ford’s. Review copy provided by Houghton Mifflin Harcourt. All opinions are my own. Amazon.com affiliate links support my book-buying habit and contribute to my being able to share more great books with you–although I prefer that we all shop local when we can! You are currently reading Seduced by Engineering at What to Read to Your Kids.